> Dell > Building an Enterprise Storage Architecture: What’s In It for You? 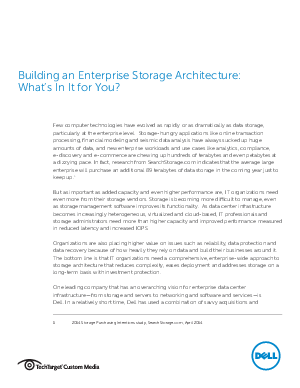 Building an Enterprise Storage Architecture: What’s In It for You? Few computer technologies have evolved as rapidly or as dramatically as data storage, particularly at the enterprise level. Storage-hungry applications like online transaction processing, financial modeling and seismic data analysis have always sucked up huge amounts of data, and new enterprise workloads and use cases like analytics, compliance, e-discovery and e-commerce are chewing up hundreds of terabytes and even petabytes at a dizzying pace. In fact, research from SearchStorage.com indicates that the average large enterprise will purchase an additional 89 terabytes of data storage in the coming year just to keep up. Read this white paper to learn why respondents to SearchStorage.com’s survey who had either already purchased a storage solution in 2014 or who said they intend to do so cited Dell more often than any other company as their preferred choice of storage solution.